MUMBAI, India, May 10, 2011 (ENS) – To save the wild yak, the Indian automobile company Mahindra & Mahindra Ltd. has sent conservationists in three of its vehicles on a rugged 16,000 kilometer journey over the most treacherous roads of the Himalayan mountain range. A collaboration between the automaker and the Himalayan Explorers, a group of motorsports enthusiasts from Nagpur, the Trans-Himalayan expedition is a unique initiative, which aims to draw public attention to the ongoing decline in wild yak populations. The yak, Box mutus, a long-haired bovine, was once found throughout the Himalayan region, the Tibetan Plateau, China, Nepal and as far north as Mongolia and Russia, but the species is now listed as Vulnerable to extinction by the IUCN Red List of Threatened Species. The species already is considered extinct in both Nepal and Bhutan. Until the 1990s, wild yaks inhabited northern Nepal, but there is no evidence that the species still occurs in Nepal today. 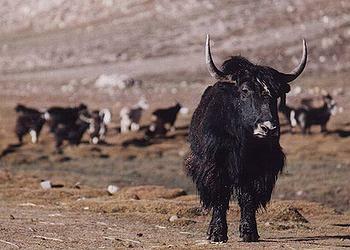 Only a few wild yaks remain in northern India, particularly in the Ladakh region of Kashmir. Yaks inhabit alpine tundra, grasslands, and cold desert regions of the northern Tibetan plateau between 3,200 and 5,400 meters (10,000 and 18,000 feet) and do not thrive in warmer climates. The species moves seasonally, descending into lower valleys in the winter. Poaching, including commercial poaching for meat, has been seen as the most serious threat to wild yaks, according to studies by renowed American biologist George Schaller and others. Males tend to be more vulnerable to hunting, especially by motorized hunters, because they tend to disperse away from the hill bases and high ridges apparently preferred by females. With the confiscation of weapons in most of the Qinghai-Tibet Plateau, poaching has declined as a threat to yak populations. Still, wild yaks have limited tolerance for disturbance from people and their livestock; they tend to move away from areas where livestock are herded. Increasing livestock herds and increased intensity of pasture use displaces wild yaks and ultimately reduces availability of wild yak habitat, according to scientists quoted by the IUCN Red List. Flagged off from Mahindra’s automotive plant at Kandivali, Mumbai on Thursday, a Scorpio SUV and two Scorpio Getaway vehicles will travel through Kibtu region of Arunachal Pradesh, travel to Ladakh via Bhutan, and visit Sikkim, Nepal, Uttaranchal, Himachal Pradesh and Jammu and Kashmir. En route, the convoy will advocate yak conservation amongst highland residents, while teaching them scientific methods of yak breeding and management. There is another motive for Mahindra & Mahindra – the company aims to demonstrate the tough and rugged characteristics of its vehicles. 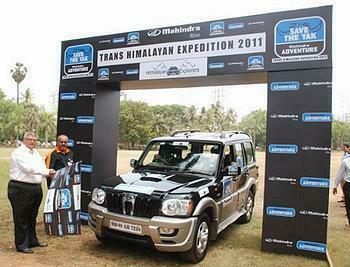 Once the vehicles have arrived at their destination, this would be the first Trans-Himalayan expedition to be completed at one stretch by any motoring organization. A US$11.1 billion multinational group based in Mumbai, Mahindra employs more than 117,000 people in over 100 countries. Mahindra has a presence in the automotive industry, agribusiness, aerospace, components, consulting services, defense, energy, financial services, industrial equipment, logistics, real estate, retail and steel.